When we decided to roll out our Jumbo Pretzel Sticks, we had no idea we were on the cusp of a scientific breakthrough. But that’s exactly what happened a few nights ago for a group of students in Fenn Tower on the campus of Cleveland State University. As you may know, students have a tendency to question things. It’s not uncommon for them to engage in lengthy conversations about important issues. On this particular evening, for example, they were pondering what life might be like without elbows. “You can forget about ever scratching your back!” said Cal, a sophomore majoring in Political Science. “Yeah, and how would you be able to brush your teeth?” said Brody, a freshman who is undecided. “I’d have to modify a selfie stick, but I think I can invent something so we can still brush our teeth,” said Justin, an Engineering student. Approximately 1 hour and 45 minutes into the discussion a stomach growled. “What in the name of Bruno Mars was that?” said Cal. “That would be my stomach,” said Brody. “There it goes again!” said Justin. “Tell us more!” cried Cal and Justin in unison. “That would be our stomachs!” said Cal and Justin. The boys rushed over to Rascal House where they met up with Kayla who was waiting with a couple orders of Jumbo Pretzel Sticks. 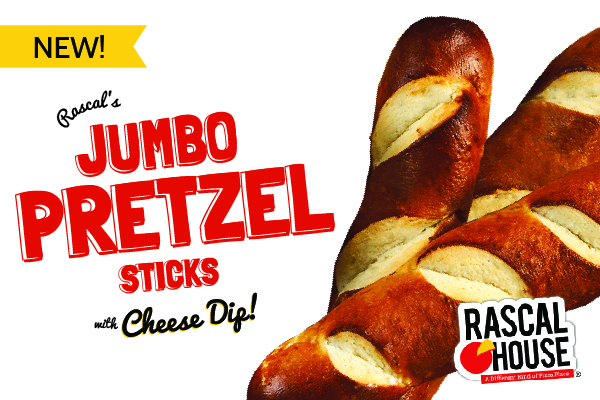 Like everything else from Rascal House, Rascal Jumbo Pretzel Sticks are best when shared with friends. Everyone dug in and started eating. Brody plucked one of the 7” pretzel sticks from the bunch and extended his arm way out in front of him. “You hear that?” said Cal. For a LIMITED TIME ONLY. Get them while they last. Then share your thoughts on Twitter or Instagram using #RascalHouse, or post on our Facebook page!